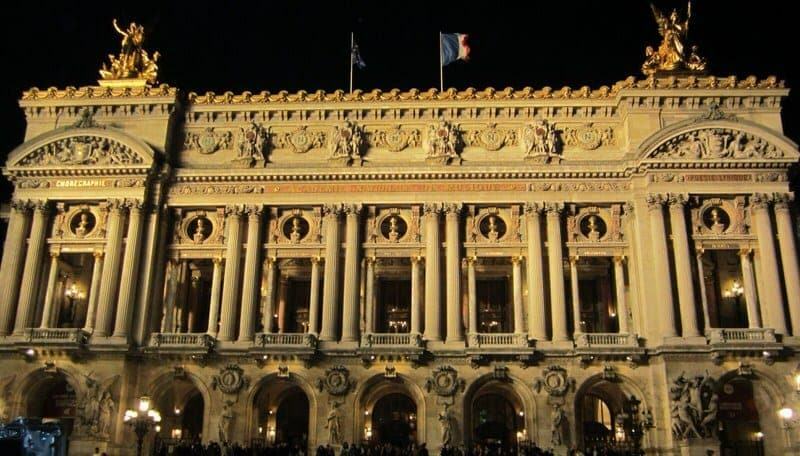 Interested in attending an opera or ballet at the historic Palais Garnier in Paris? This article explains in detail how to book tickets online for the Paris Opera. It will provide step-by-step guidance on using the Paris Opera website along with a number of tips based on our own experiences on booking tickets and attending performances at the Opera Garnier. It also gives you resources if you are trying to book a performance that has been sold out or if you need to resell your Paris Opera tickets. Now if you have already booked tickets, go to our article that provides Paris Opera tips on what to wear and what to expect during the actual performance. While most people’s visits to Paris may not be complete without a visit to the Lourve or the Eiffel Tower, all three of my trips to Paris thus far have included attending a performance at the Palais Garnier, often referred to as the Opera Garnier or the old Paris Opera House. 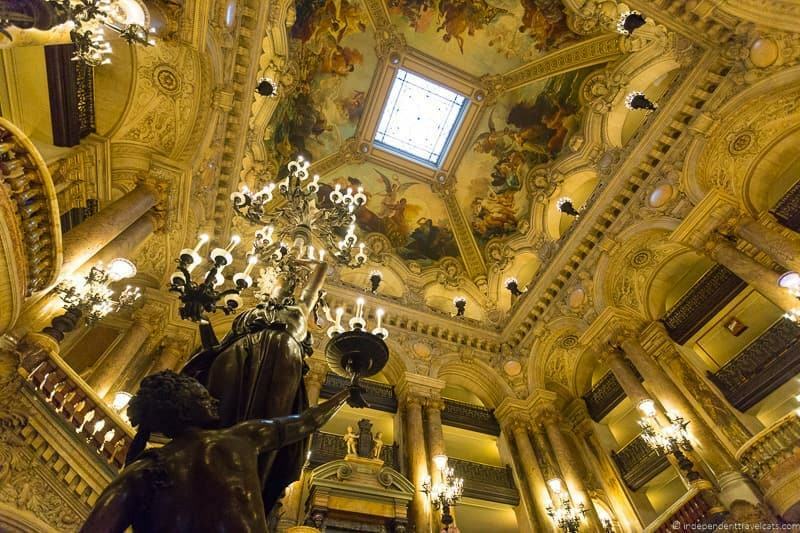 I really love the Opera Garnier and find it to be such a beautiful building, full of history and myths. It is quite amazing that it is still functioning as a world-class venue for concerts, theatre, and opera. My first experience was in 2001 where I attended a performance of Kenneth MacMillian’s L’histoire de Manon while sitting below the beautiful ceiling painted by Marc Chagall in orchestra seats. In my two more recent trips, I have sat in more economical seats in the Amphitheatre. First to see the Tokyo Ballet present a ballet called Kabuki in 2012 and then most recently to see Handel’s Giulio Cesare opera in 2013. 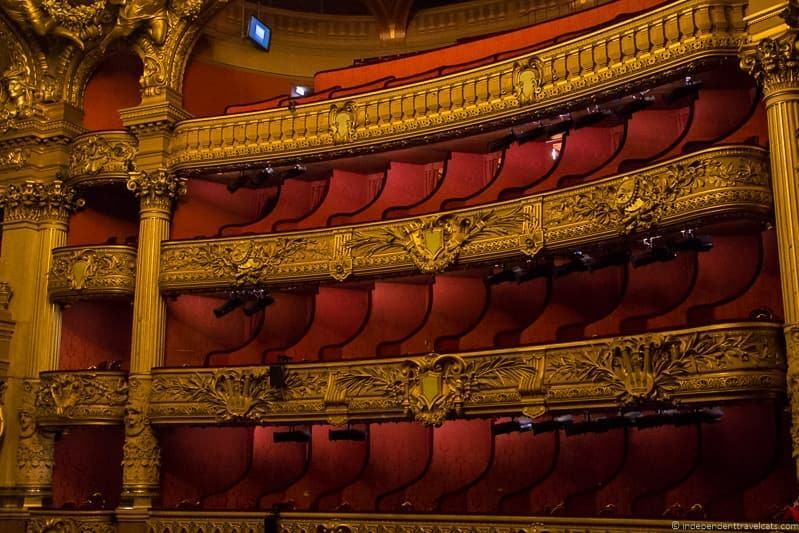 While you can also see performances at the more modern Opera Bastille, it does not offer the same sort of old world ambiance that can be found within the walls of the opulent Palais Garnier. Note: This guide was last updated in 2017, and the procedure and website has changed a lot over the last few years. When I first wrote this guide, the website was quite terrible and many people had difficulty using it, but it has since improved greatly so you should be able to figure it out using these guidelines even if things have changed a bit. Please feel free to leave me a comment if you notice any changes and I will modify the instructions for future readers. If you have any questions, I am happy to answer them and provide any help I can. 1) Check schedule of performances online at the Paris Opera website . This schedule includes performances at BOTH the Paris Opera Garnier and Opera Bastille. You can change the website language to English by clicking English in the menu from the top of the page. 2) Click on Calendar to see everything that is playing by month. This will give you information on date, time of the start of the performance, the title of the performance, type of performance (ballet, opera, concert), and venue (Bastille or Garnier). 3) Once you note what performances are happening during your visit, click on the link to the performance of interest. On the left hand side of the screen, you’ll see the booking calendar for that performance. If the date is an orange color, it means booking is available and open. If it’s gray, it means either booking is not yet open or there are no seats currently available for that performance. If booking is not yet open, you can then check the Booking Calendar to see the opening sales dates for tickets sold by Internet, telephone, in-person purchases (at the ticket office counter located at the opera), and group booking. 4) Next, whether you are able to book now or need to wait for booking to become available, you should register on the website now as you’ll need to do this if you plan to book online. You can do this by clicking on the “Log In” or “Register” links at the top of the home page. This will take you to an area where you can register as a new user and create an account. Put in your information and make sure you know your country’s telephone code (United States is +1 and France is +33 for instance). Once registered, you should get an e-mail from the opera and you should be able to log into your account by going to the “Sign In” link. 5) For those waiting for booking to open, it will open on the stated date at 9:00 am Paris time (you’ll need to figure out when this is in your own time zone) for both telephone and online sales. If you believe that the performance you want to see might sell out quickly, need a group of seats next to one another, or you really want a specific type of seat, it is probably wise to plan to book online as close to that opening time as possible. Ideally, you will be at your computer, logged into your account, and on the booking link for the performance and date of choice 20-30 minutes prior to opening as an “online line” sometimes forms for popular performances. If a queue does form on the day you want to book, as long as you are on the website and logged into your account you should then be asked to join the line to be able to book. Once it is your time, you need to be on your computer as you will generally then be given 7 to 10 minutes to make your booking. It is a good idea to go through the rest of the steps below now for practice so you know how the booking process works. It will also help you get a better idea of the types of seats and the views of the stage from different seats. You can simply cancel the transaction at Step 10. 6) Once you are ready to book, you will login using your e-mail and provided password. You can change the password if you wish once you login by going to Change My Password. 7) Now, go to the Booking link of the performance you want to attend and click the appropriate date. You’ll likely see a timer on the side that tell you how much time you have to complete your order (this is often 7 minutes or 10 minutes). 8) You’ll be asked to first choose the number and category of seats. Prices will be displayed for each seat category type and a crude color-coded drawn map of the seating areas will be shown (don’t worry you’ll get more info later). At this point, you’ll likely see a timer on the side that tell you how much time you have to complete your order (this is often 7 minutes or 10 minutes). 10) At this point you’ll want to do one of the following: 1 ) accept the offered seats (or modified ones) and move forward with payment, 2 ) Delete these seats and start again if you want to choose seats from a different category and repeat Step 9, 3) or Delete seats and Cancel the reservation. Now, if it is a popular performance I would keep the first offered seats in your shopping cart until you find alternative seats as if there are only a few available seats left, you may end up with no seats if you wait too long to book. At this stage, you also will sometimes have the option to purchase a program voucher (~ 12 euros) and this will be used to collect a printed program on the date of the performance. 11) Once you choose seats and hit Book, be sure to carefully review your order information as once you purchase the tickets you will not get refunded unless the performance is cancelled so make sure the date, performance, venue, seat number, and price are all correct. Before you start entering your payment information, you will be given the option to have the tickets mailed to you at your home mailing address for a small fee (3 euros), or you can simply print the electronic tickets for free. You’ll receive a confirmation e-mail of your purchase at your registered e-mail address. If you opted for electronic tickets, the tickets will be available as a PDF that can be downloaded and printed by logging into your Paris Opera account. If you opted for paper tickets, they will be mailed at least 2 weeks prior to the performance, so before choosing this option make sure that this does not coincide with the dates you will be traveling. If you are having difficulties using the Paris Opera website or there are no available tickets for the performance of interest, you can check for tickets on Classic Tic, which sometimes has tickets even when performances are shown as sold out. As pointed out by one of our readers, you might want to call your credit card or debit card company prior to booking if you do not regularly make international payments just to be sure your card is not declined. When looking at the website’s crude seating chart of the Paris Opera Garnier, even-numbered seats are on the left half of the chart, uneven-numbered ones on the right side. While if you book in-person at the opera, they can show you a detailed seating chart, and during online booking you can also see a detail seating chart. Go to “View/Modify Seats” link and this will show you where your seats are and allow you to view and choose other available seats in your chosen seat category. If you need to re-sell your tickets for any reason, you will likely not be able to get a refund but you might try reselling them at the Paris Opera’s sponsored website ticket exchange noted above. If you are interested in a performance, but seats are shown as being sold out online, keep checking back as seats regularly go back on sale. You can also try calling the box office once phone booking opens up, as even if there are no tickets currently available they may be able to provide advice on how to optimize your chances to get tickets. You can also try booking tickets on the Classic Tic website or the Opera’s sponsored website ticket exchange website. Lastly, you can try the box office 45 minutes before the performance for last-minute tickets (sometimes they can put you on a waiting list for reserved tickets) and for specially discounted tickets (for young adults, unemployed, seniors, etc.). If you are physically handicapped or have visual or auditory impairments, you should contact the Opera box office for accommodation options. On certain Wednesdays at midday (noon Paris time), the Opera de Paris has flash sales online on discounted tickets and sells the last tickets for sold-out performances, you can find out more here. If you need to book tickets for more than 6 people for the same performance, you will not be able to do this under the same account. You can either wait until phone booking opens or better yet have a companion book any additional tickets under a separate account. Sometimes for particularly popular shows, they may limit the number of tickets even further to 2 or 4 tickets per account. If you are booking at least 10 seats, you may qualify to book through the Opera’s Group Service booking option. Check their website or e-mail them (groupes@operadeparis.fr) for more information about group booking. We have chosen our seats based on trying to get the best tickets for our budget. Since we have so far attended more for the ambiance and experience than the specific performances, we have opted for cheaper seats. However, if you are really excited about the specific performance or place a high value on comfort, it would be wise to spend a little extra for a better seat. For instance, our 20 euro each Amphitheatre seats (Category 4, seats 144 and 146) in 2013 had a great, if distant, view of the stage and came at an excellent price; however, these seats are narrow folding seats with little leg space and are placed high so that shorter people’s feet (like mine) don’t quite touch the ground. It can also get quite stuffy in the auditorium, especially in the upper areas such as the Amphitheatre. It became quite hot and uncomfortable after about 30 minutes during the last performance we attended. If you want a seat in a box (loges or baignoires), I would try to get one in the first row (Seats 1 and 2) as those in the rows behind often need to lean over or even stand up for a good view of the stage. Note that Balcon (which are not like actual balcony seats, but are the second set of seats behind the orchestre seating section) and Baignoires (which are ground-level little boxes) are not the same thing. Balcon seats are generally preferred, and more expensive, compared to Baignoire seats. The best seats can be debatable and a matter of preference, but generally the seats most people would likely choose to sit in if price was not object would be Optima seating (when available), Orchestra, Balcon, and first row seats in central boxes (loges de face). For seats in the orchestra, balcon, and amphitheatre, the lower the seat number, the closer it is to the stage. Note that côté means side (so a loge de côté box seat is a seat in a box to the side of the horseshoe-shaped theatre) while face means facing (so a loge de face would be a seat in a box facing center stage). The categories of tickets of the Opera Garnier are Optima (best and most expensive) and then Categories 1-6 (tickets in the 1 category being the best of these and the most expensive and those in the sixth being the least expensive with generally the worst views). Be advised that tickets in the latter two categories (5 & 6) may have quite obstructed views of the stage and you may need to stand to see anything. My advice would be to only buy Category 4 or better tickets, especially if seeing an opera or ballet where a view of the stage is important. The cheapest tickets are generally not available online and must be purchased through the box office. The row and seat numbers can be confusing if you are not used to this style of seating, but generally if you want contiguous seats (seats next to one another) even seats (44, 46) will be next to one another as will odd numbered seats (3, 5). Also seats 1 and 2 will be next to each other on a row. In boxes (loges), the number of seats varies, but Seats 1 & 2 are always in the first row. In a 6-seat loge, Seats 1 & 2 are in the first row, 3 & 4 second row, and 5 & 6 third row. The website will generally tell you if the offered seats are not contiguous prior to purchase. The numbering system can be a bit confusing, but you can check the seating chart to be sure (under “View/Modify Seats” as noted above in the Booking steps). You can also check out our follow-up article that covers common questions such as when to show up, what to wear, and what to expect in our Opera Garnier guide. OK, so at this point, hopefully, you have successfully booked your tickets and are looking forward to your visit to Paris and the Palais Garnier. Enjoy this article? 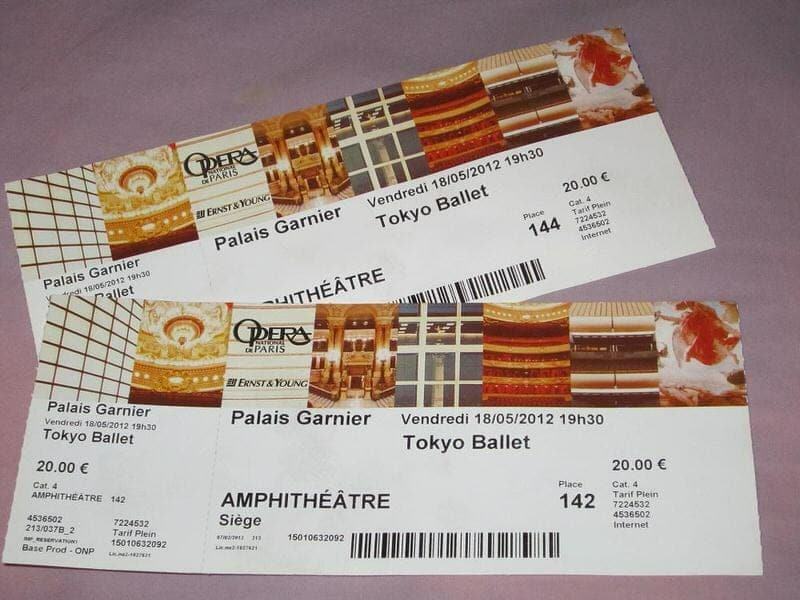 Have additional tips or questions about booking tickets online to the Paris Opera Garnier? Feel free to leave us a comment below. I stumbled upon this post as I was reading your Paris Itinerary (which is also a great one). I have visited Paris so many times but had never thought of watching any opera, ’till the next trip as I am bringing my husband and it’s his first time so I want to experience different things. And because of your post I actually checked the opera website and theres a Cinderella Ballet show during our trip. So thank you so so much because without you I wouldn’t have included that in our itinerary. Thank you so much for such a detailed article (and website!). My husband and I are taking both sets of our parents to Paris this Fall (November 18-23) and sadly it seems nothing will be performing in the Palais Garnier due to it being a low season I assume. I’ve been on the tour as well as seen a performance, and I want to give them that same opportunity. Since there are no performances scheduled there, are there any other performance venues that you’re familiar with that offer dance/opera/etc? We will still tour the Opera House, but I’ve always found theater a great way to fill the evening time…especially if it’s cool out! Thank you again! Sounds like you have a nice trip to Paris planned, and it is great that you can enjoy it with your parents. Sometimes performances may be sold out on the Opera website, and if so, you can also check ClassicTic as they sometimes have tickets. You can also find tickets to other performances in Paris there. Another performance venue I’d recommend is Comédie-Française (its a historic state theater) and it looks like they also have performances happening in November. Jazz clubs and concerts, such as the Jazz Club, are fairly easy to find in Paris if that is of interest. Sainte-Chapelle often has evening music concerts and choirs surrounded by all the beautiful stained glass. There is also the Moulin Rouge, Lido, and Le Crazy Horse if you are interested in a cabaret style show – all of the venues holds performances almost nightly. I am sure you’ll find something that you’ll enjoy in the evenings. Wishing you a wonderful trip to Paris, and please let me know what you decide to book! Ha! I wished I had read this, would have saved me a lot of time last weekend when I was buying a ticket for one of their lunch concerts. Huge tip I learned btw: their lunch concerts are almost cheaper than one of their regular tours and you get some classical music. Hi Jessica, This is a really helpful blog post on visiting the Paris Opera. 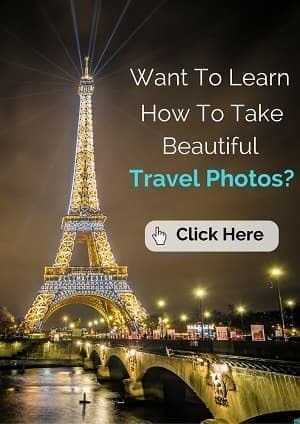 I think people will find this article so helpful when they travel to Paris as it is written is such a very nice manner. 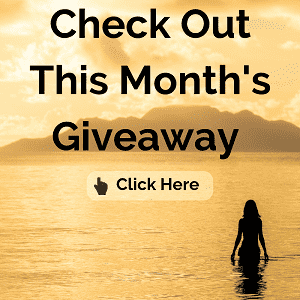 I really appreciate your blog! Hello! Your website has been wonderfully helpful in figuring out the opera facts, seating, and most importantly to me, the fact the there is an official ticket exchange through the Palais Garnier website. Maneuvering through it has been a bit tricky, however, as it is only available in French, with no other language translations available. My friend and I are traveling to Paris this Fall and happen to be in town for the Balanchine ballet opening night, for which the tickets were all sold out. So I tried to purchase tickets through the exchange after setting up an account – the first time, for some reason (since I can’t read French) my purchase was cancelled within an hour, I’m guessing the seller didn’t want to sell their tickets after all. The second time the purchase went through, and the seller has been wonderful, emailing me right away, asking for the names to put the tickets in and then emailing the tickets to me. However, he did mention that I need to go into my account on the exchange website and indicate the transaction is complete, and I keep trying to figure out how to do so, but cannot. Are you aware of this, and if so, are you able to direct me how to do this? Thanks so much for your feedback! Hi, Jessica, thanks so much for your response. I wanted to let you know that with the help of the seller of the tickets, I was able to finally figure out how to complete the transaction. He suggested that I go back to the last email that the Palais Garnier had sent to me after I purchased the tickets, which was the confirmation email, and click on it. It took me to the Opera Exchange site, but a page I had not seen before once I logged in. It gave me an option of indicating that the transaction was final, as well as to rate my dealings with the seller. Interestingly, it would not let me complete this page unless I also added comments about the seller. Once I did, I was able to save everything, and I then went back into my account the verify it was complete, and I could tell that the pending status was gone. Maybe there’s some way to do this directly through the website that I’m unaware of or can’t figure out because I don’t know French, but what an easy solution to follow the link from the last email from the Palais Garnier. Needless to say, I rated the seller the highest rating I could, he was wonderful to work with. Im a very small asian girl, this will be my first time in paris and first time to ever watch an opera and i’ll be travelling alone. If I choose the seat in CATEGORY 1 AT THE ORCHESTRA 3RD ROW FROM THE ORCHESTRA is that better than the CATEGORY 1 BALCONY, 3ES LOGES DE FACE, FRONT ROW 3RD SEAT? My concern is that if I watch the opera in the orchestra level – i might not see the opera at all because the 3 people in front of me might block the view haha! please help me. IS IT BETTER TO SIT AT THE BALCONY INSTEAD but I DO WANT TO BE CLOSE TO THE ORCHESTRA. 😀 Thank you! Thank you so much for the quick reply! I shall book the one near the orchestra. Merci! I’m so glad I found this website/blog! I will be going to Paris for the third time in September 2016 and there is finally a ballet at the Opera House while I’m there. I have been trying to figure out how to book tickets without going through a third party and your link was just what I needed. I stay a block from the opera house but have never been there. I’m really looking forward to actually seeing a performance. WHat a great article on how to book ticket for paris Opera House ! I just wanted to add a comment because our website http://www.music-opera.com also offer tickets for the complete season of Paris Opera House and many other operas houses around the world. It’s possible to book before public opening dates. Beside, if you have a problem and cannot attend, we help to resell your tickets. Don’t hesitate to contact me for further information.. I was still unable to have my phone number counted as “a l’etranger,” but I decided to look at the website again. The “Reserver” button for my performance was orange! There were two very good seats! The transaction was very easy by internet (once I realized that I needed to leave the hyphens out of my telephone numbers). After I had printed my tickets, I checked the website again, and it indicated that the performance was sold out. We were lucky in our timing! What a wonderful, thorough explanation! Thank you!! We want to get tickets to Les Enfants du Paradis on May 30. The “Reserver” buttons for all the performances are gray, so we are thinking that this production hasn’t gone on sale yet. You have a link to connect us with information about when the tickets will go on sale, but it did not take us to that information. I was also not able to find the information myself anywhere on the Opera Garnier website. I decidedI would just call and ask a human being, but when I dialed the number on the website, 33 1 71 25 24 23, I got a recorded message that said the number was only available to people in foreign countries — even though I was calling from the U.S.
I’m feeling completely stymied and wondering if you have any suggestions. We would be very appreciative of any help you can give us! Yes, the website keeps changing and I think they took down the ticketing schedule for some reason for this season. So most of the performances appear to be sold out as the Spring season has been on sale for a bit, including the May 30th. There are Enfants du Paradis tickets available still for June 4, 2015 for the evening performance at 19:30 (7:30pm). So you can either log onto your personal account and then click on Ticketing and then choose the performance or you can go directly to that performance, select the date, and then book the tickets. Hi there! Just wanted to say I am so thrilled to have discovered your blog and found the advice on booking tickets for the Paris Opera so helpful. I have just booked tickets and am so excited! thanks again – love the blog and photos! Thanks for taking the time to tell us that this article helped you booked tickets to the Paris Opera. We appreciate hearing that the article was useful. Enjoy the performance – I can’t wait to return to Paris! Oh, my, this posting is SO HELPFUL to me!!! Thank you, thank you. I need to re-sell tickets, as we will not be in Paris on the date. You told me how to re-sell them. Hopefully, someone will purchase and I will recoup some of my money. What a wonderful post. Hi Marsha, so happy to know that this post was helpful to you! We hope that you are able to re-sell them on the Opera ticket exchange website. Thank you for sharing this article! It was such a helpful insight! I followed your steps and registered a log in. Having read all the previous comments above I would appreciate if you could help me out here. My mother and I are very keen to watch the “L’INCORONAZIONE DI POPPEA” which will have its first show on the 7th of June 2014. However, the “B” logo is greyed out for that date whilst other dates from 22nd of June onwards are in orange. Does it mean that the show for 7th of June has been sold out? Or the sales haven’t started yet? Hi Maggie, yes, unfortunately it does appear that specific performance is already sold out online as it is gray and the others are orange which means you can book them. If you can’t make any of the other performances during your stay in Paris, I would suggest that you keep checking back periodically online and also trying by phone when phone booking begins (check calendar for online, phone, and in-person booking dates). You can also try to buy tickets resold on the exchange. Since that is the opening date for that performance, they often sell out more quickly, but I would keep checking back. Good luck! Hi travelcats, Thanks for your prompt reply! I have found the calender; unfortunately the phone booking has already started in march. I will definitely give them a call tomorrow. Thank you so much for this article! Very helpful I am going to book our tickets now! We are alway so happy to hear when our articles help someone in planning their travels! Have a wonderful time in Paris and at the opera. One of my favorite venues in Paris. Thank you! This was an amazing post and exacly what I needed! Hi Greta, I am so happy this article was useful to you. Have a wonderful time at the Paris Opera and thanks for commenting! Thank you travelcats! I just booked two very good although very expensive tickets for the 2014 premiere of Gluck /Pina Bausch/ “Orphée et Eurydice”. And it was claimed to be totally sold out, up until today. Yeah, Leo, so glad to hear our tips helped someone get tickets! It can be challenging to get tickets for certain performances, but it does seem if you keep trying the various methods (online, phone, re-sell website, ticket booth) most people typically can get tickets. Given that the opera doesn’t refund tickets, it is a bit of a mystery how they go from being ‘sold out” online to having tickets available, but I have noticed this several times. Always good to keep checking back! Have registered and will call on 19th as well….you are right, I should keep trying. Thanks for your support. Terrific instructions! I have actually booked tickets before when visiting Paris using the website and not had a problem. However I have a new challenge for this visit: there are 6 of us and we would all like to be together in one of the boxes. Any suggestions? Hi Daniel, thank you for the compliment, we are happy the instructions are helpful. Now, booking 6 Opera Garnier tickets in a box (or loge) can be a tricky matter as you’ll need to book all or most of one of the boxes. The tricky thing about it is that different seats in the same boxes are usually in different pricing categories. So for example, I did a mock try and found that to get a 2nd floor loge de face, 25-27, for seats 1-6, I needed to book seats 1-3 in Category 1 and Seats 4-6 under Category 2. This means for these particular seating combo you have to enter 3 seats in Category 1 and 3 seats in Category 2 for it to give you this suggestion. The first website suggestion was 6 seats not together but after clicking the “Autre proposition de place” link a couple times, I found these six contiguous seats in the same box. So unfortunately since some of the boxes are composed differently it is hard to figure out how many seats are in each category in the same box. But with some patience it can be done and just make sure it says contiguous at the bottom before booking and also I would make sure you look at the original French as the English translation for seats types does not say box or loge (so just make sure it says loge in the original French version). For best chances, you can try booking when the online booking becomes available (just translate date and time to your time zone) and if you can’t get it the first day keep checking back for several days as not all seats are put online at same time and availability seems to fluctuate a lot. Also, if online isn’t working out, you can wait for phone booking to open and call to do the booking. Also you can feel free to e-mail me and I am happy to take a look once the online booking is available. Also, just note that the back rows in boxes can have sight obstructions and shorter people should definitely be seated in the front rows to get best views from the boxes. Hi Daniel, oh, I am so sorry to hear that. A short queue I have had before, but never one that long or the 2 ticket limit. But I guess for performances like this one, they get so much demand on the website at once. But I would not give up, at least not for you and your wife. Go to http://boursechange.operadeparis.fr/ and find the performance and put in your e-mail to get alerts whenever new tickets come up for resell. I would also try checking back periodically on the regular website and call when phone booking opens (Nov. 19th) to see if they have any tickets or more tips on best way to get them. There are also often some last minute before the performance tickets as people don’t pick up their reserved tickets, but that is probably too last minute to depend on for those traveling. Hello Ethan, Jessica and readers! 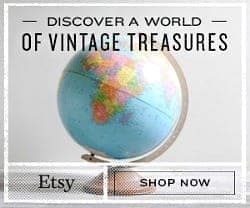 Thank you for taking the time to create this site ~ so kind and helpful! Indeed, the website for the Palais Garnier is as temperamental as the venue is beautiful! I’m getting hung up on ~ of all things ~ adding my telephone # when registering simply to get the ball rolling! The drop down has +1 and up, then you add your phone. Seems pretty simple, but the site won’t take my number, and won’t let me proceed to ordering. What am I doing wrong (: – ) ? Thanks for any help you can offer. Really would love to order tix for a great dance performance before we leave. Thanks! 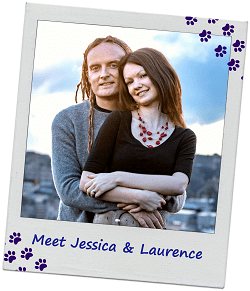 Hi Jessica – Thanks for the tips; all is well now, except the tickets disappeared in the meantime! The Opera does have a nifty marketplace where ticket holders can sell-back unwanted tix, so I’ve written to someone (using Google Translate, thank you!) to try to track down an alternative. New Question! The Palais Garnier is so stunning I’d like to have more time there: Can you walk around inside before a performance, or do you recommend the tour? Hi David, yes, you can try the Opera exchange website. I would also keep checking back online and also try calling the Opera ticket office during their business hours (they almost always have someone who can speak English available). There are also tix that are available at the ticket window before the performance that you can buy in person that are not available by phone or online. Good luck. As far as touring, we have not done the tour but I have heard very good reviews of it so would recommend. But if you can’t do the tour, we always arrive a bit early (30-45 minutes) and wander around. All of our pictures are taken before performances or during intermissions, see our second article on attending the Paris Opera for more tips on this. Hi Jessica – Good news ~ more seats have been made available for the performance we’re interested in, as suggested! Now, with no true seating chart available, can you tell me from your experience which are the seat numbers in the middle of the orchestre or balcon? Also, do you know the row letters that begin these two seating areas, as some theatres begin with AA, etc.? Sorry to bug you again! PS Also had a look at your discussion of the Seine bateaux, nice! Hi David, glad that more seats were made available. This is often the case fortunately. Now, you can see our charts in the post with all the seat numbers, there is one for the Balcon and for the orchestra seating sections. These may not be be exact but from all reports so far, we have been told they are pretty accurate. I think the seats are just numbered by section, I don’t think they use letters. When you book, you’ll get to see the seat number and more importantly a preview of the view from each seat as described in the post. If you have more specific seating questions, you can e-mail me (Contact Us). Thanks, glad you found the Seine cruise article helpful. We have tons of more info to add about Paris so feel free to keep checking back! Hi Jamie, I am no expert (and the seating can be confusing) but I believe that according to what I know that your seats are next to each other. Is the wording “loges” or “loyes”? The numbering in loges (or boxes) is different than in the regular seats and from what I can tell you are in a second story box, in the second row from the front, facing the stage. I think the problem you may have is that there will be two people sitting directly in front of you in the box, but I do believe that your seats are next to each other. If you call the Opera or e-mail them, they should be able to check on this for you as well. Enjoy the show! Thanks, Travel Cats, for all the great info. I just finished booking a pair of tickets for a December 2013 performance. This info was especially useful to me: that the tickets that are posted to one’s mailing address are sent out about 2 weeks prior to the performance. Well, that decided it for me: I opted to print them off at home, because we depart from home 10 days before the performance. Anyway, your readers might be interested in additional observations that I had: (1) I tried to enter the website right when online booking became available. It turns out that one has to wait in a queue to do that. My wait was about 15 minutes. Not a problem. (2) When I selected the performance date, there was not a large choice in the seating categories available. Also, when I attempted to select 2 tickets, that was not allowed! Only a single ticket appeared as an option (in a dropdown box). But here’s what happened: I refreshed the web page repeatedly, and different seating options appeared, both in the seating categories and in the number of seats available. I was able to select a pair of seats for my seating category. but when I attempted to add them to the “shopping cart” a message appeared which said, more or less, that internet booking was unavailable. I did not give up, however. I kept re-entering the seat selection web page for my performance date. At one point, even, the little calendar (on the left) that shows which dates have tickets available indicated that my date was sold out. (The color of the “B” symbol changed to the color that indicates that no seats were available!) But I still did not give up. Suddenly, the color changed back and the link to my date became active again. I was finally able to select seats, and purchase the tickets. So, my message to your other readers is: don’t give up easily! Thank you so much David for taking the time to share your experience booking Palais Garnier tickets. I have not found their online booking system to be that user-friendly and it sounds like you had a particularly trying experience, but I am so glad your persistence paid off. Thanks for your information. I was able to buy a ballet ticket for my upcoming trip to Paris. I had bought them before but quite a few years back – then you couldn’t print it at home – this is quite easy. I did call my credit card company (US) beforehand so I had no problems at all…. Thanks Mara for letting me know that this information was helpful to you in booking your ballet tickets. Yes, I think they only implemented the print at home option fairly recently as our 2012 tickets were still mailed to us, but we were able to print our 2013 tickets. Thanks for the tip on calling your credit card beforehand, that can often be quite helpful as they may block the foreign charges thinking they are fraudulent. I hope you enjoy your upcoming trip to Paris and the ballet! The information you offer on this web site has helped me greatly. Thanks for all of your time & work. Thanks Baetz, I am glad this article was helpful to you! Wow, this is such a comprehensive and detailed article on booking tickets to the Palais Garnier! I had the opportunity to attend once a long time ago and booked by phone back then, but will certainly return to this great article if I am lucky enougn to return. I think another article about your experiences at the Opera would also be helpful to readers as so many people are not sure how to dress or behave at the Opera. Just a thought! Thanks so much for the comment! Yes, that is a great idea to add a follow-up article on tips for actually attending a performance. I will get started on that and get it up on the blog in the next week or so. Stay tuned!